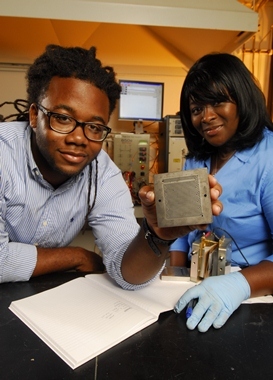 The Nuclear and Radiological Engineering program has students who do undergraduate research each semester. Undergraduate research is a search or discovery of new information; an adventure into solving real world problems. Having research experience is critical when applying for graduate and professional schools and is impressive to prospective employers as well. All students must have a permit to register for research. Research Assignments are independent research conducted under the guidance of a faculty member. Research assignments are 4699 for juniors and seniors and 2699 for freshman and sophomores. Research assignments are taken for class credit. Paid Research Assignments are research internships. Students are paid for working on a project. The class will be on your transcript, but no class credit is given for this option and no grade is received for this class. Students who received PURA awards register for the paid research assignments, 4699. In all cases, finding a faculty member to work with is solely the student’s responsibility. The best way for you to find a research position is to talk to the professors on your own. Look through the Woodruff School Research Areas and see which professors are doing research that you may be interested in. You should then contact the professor, send a copy of your resume and ask if he/she is interested in sponsoring you for research. Talk to your current NRE professors to see if they work with undergrads on research. Talk to your NRE faculty advisor. Go to the VIP website for a list of the current VIP projects. Go to Georgia Tech Undergraduate Research to view institute-wide research opportunities. All courses require a permit to register. If you plan to do research for a faculty member outside of ME or NRE, you need to contact that department for instructions to request a permit. All research assignments must be submitted by noon on the last Thursday of phase 2 registration (first week of school). Submissions after this time will not be processed in time and the student will not be able to register for the research class for that particular semester. NRE students can satisfy up to 4 hours of technical elective credit with 4699 and 4903 as long as the class is from the College of Science, College of Engineering or College of Computing.